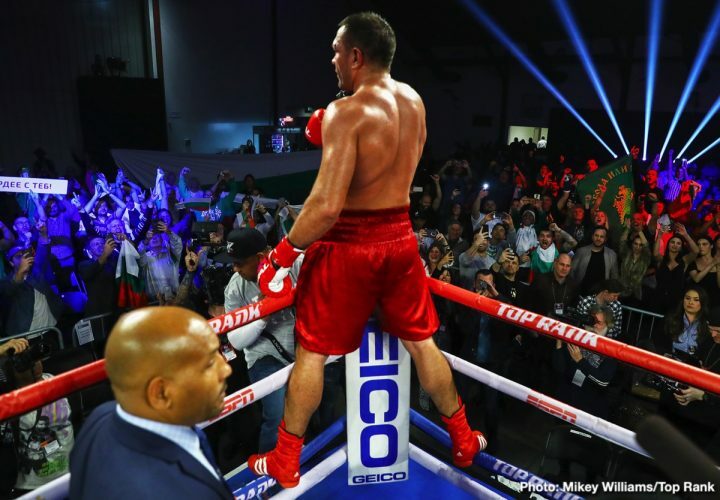 By Dan Ambrose: Heavyweight contender Kubrat Pulev (27-1, 14 KOs) had to dig deep to defeat Bogdan Dinu (18-2, 14 KOs) by a seventh round knockout on Saturday night in a scheduled 10 round fight on ESPN at The Hangar, in Costa Mesa, California. 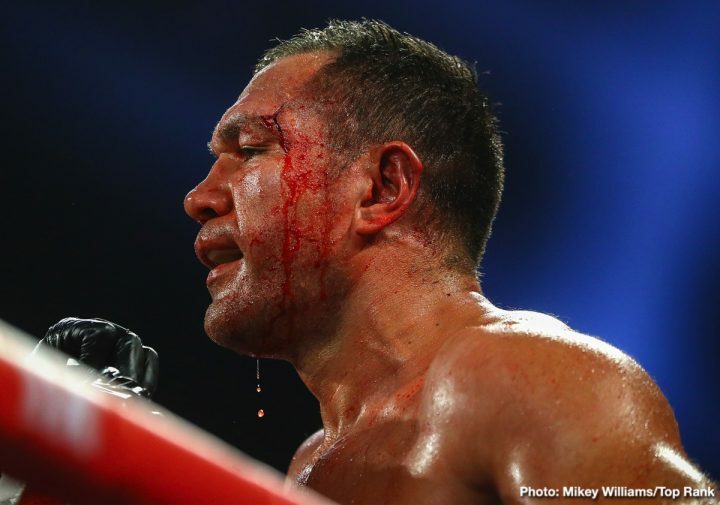 Pulev, 37, suffered a bad cut over his left eye in the third round. 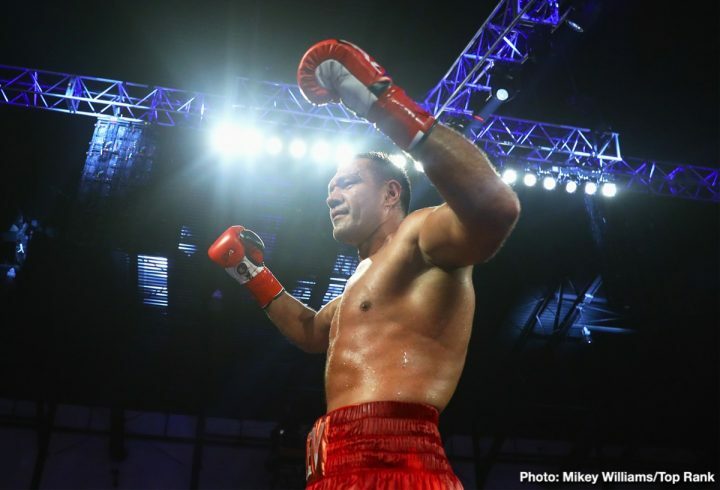 In the seventh round, a disparately looking Pulev came on strong to knockdown Dinu, 32, three times before the referee Raul Caiz Sr. halted the fight. 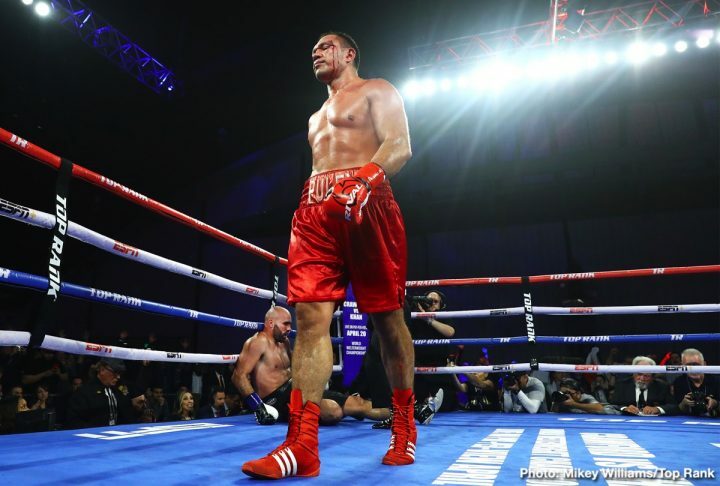 The official time of the stoppage was at 2:40 of round 7. The seventh round was crazy. 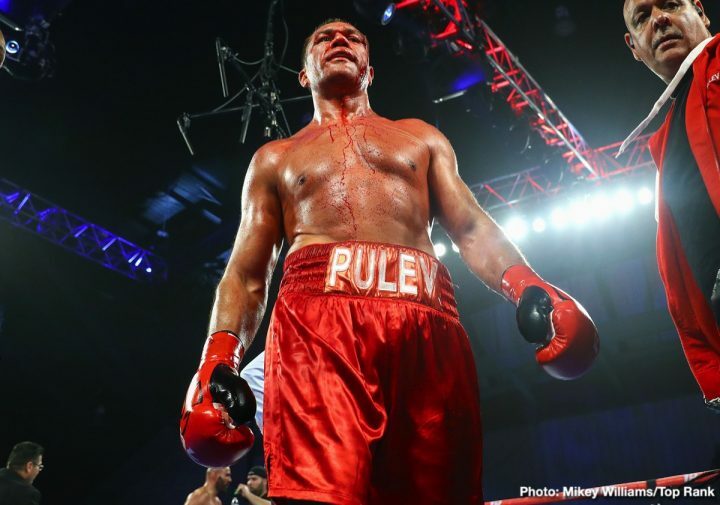 Pulev dropped the 6’5″ Dinu, but then hit him while he was down. It looked like Dinu was too hurt to resume fighting. 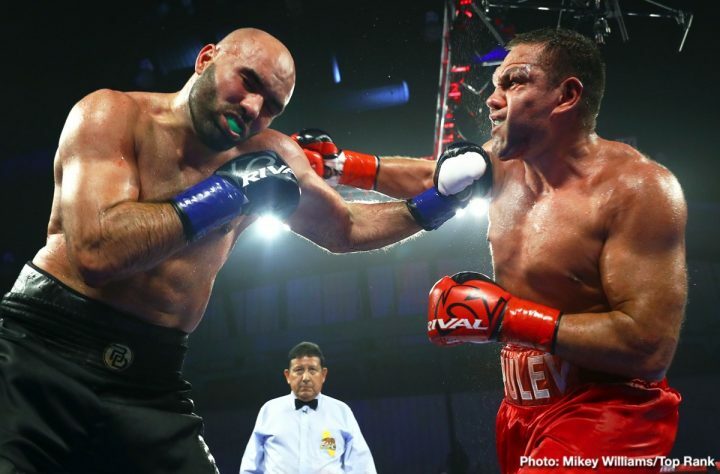 But after being told that the fight would go to the scorecards, Dinu got back to his feet and resumed fighting. 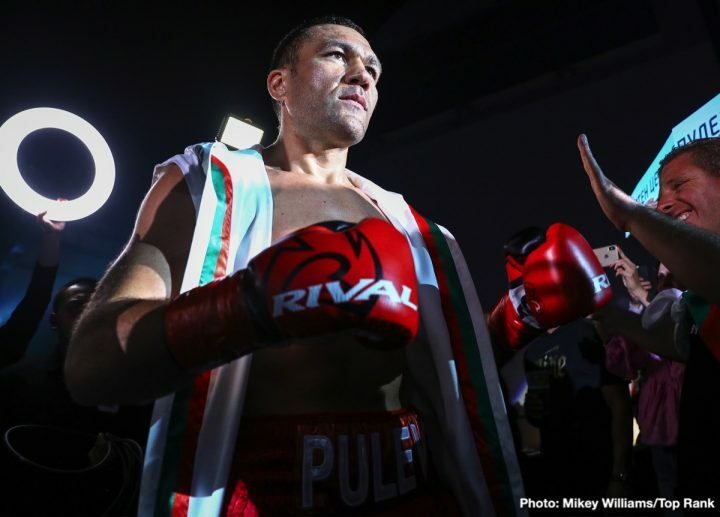 It’s unclear if Dinu would have stayed down if there was a chance that Pulev would be disqualified.After the fight resumed, Pulev knocked Dinu down twice before before the fight was finally stopped by referee Raul Caiz Jr. At the time of the stoppage, the scores 58-56 Pulev, 57-57 and 57-57. 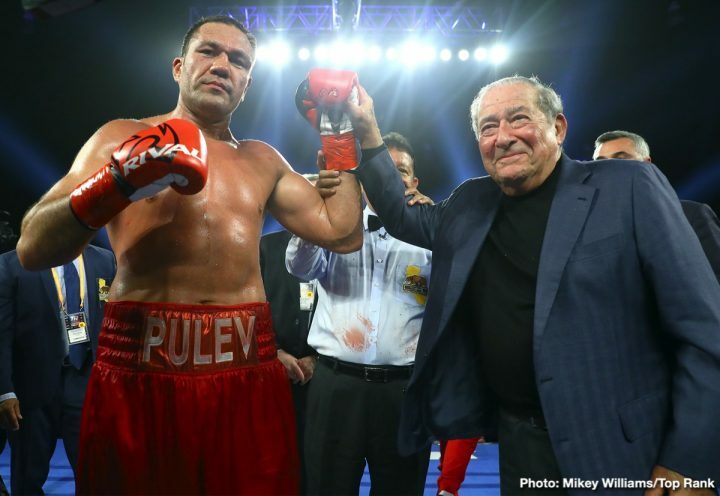 Boxing News 24 had Pulev ahead 58-56 at the time of the stoppage. 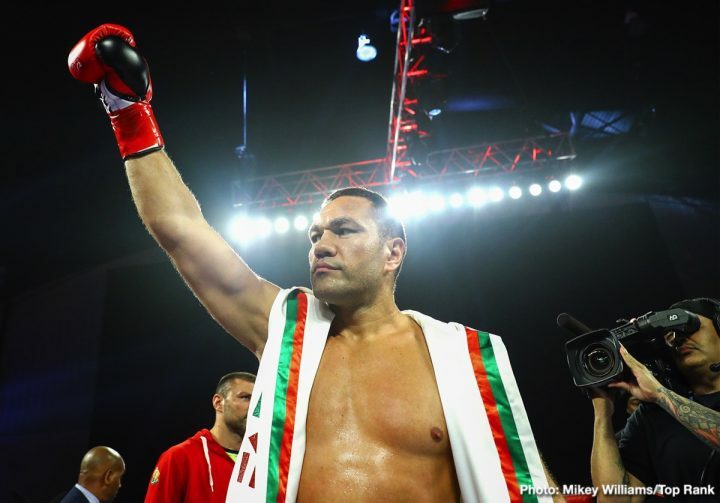 This was a close call for the 6’4 1/2″ former heavyweight world title challenger Pulev, who recently signed a co-promotional deal with Top Rank Boxing. 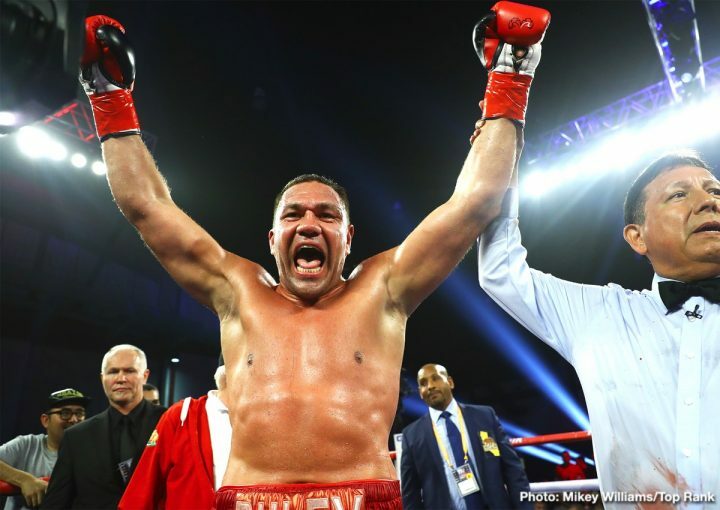 Pulev is the WBO mandatory for WBO heavyweight champion Anthony Joshua. 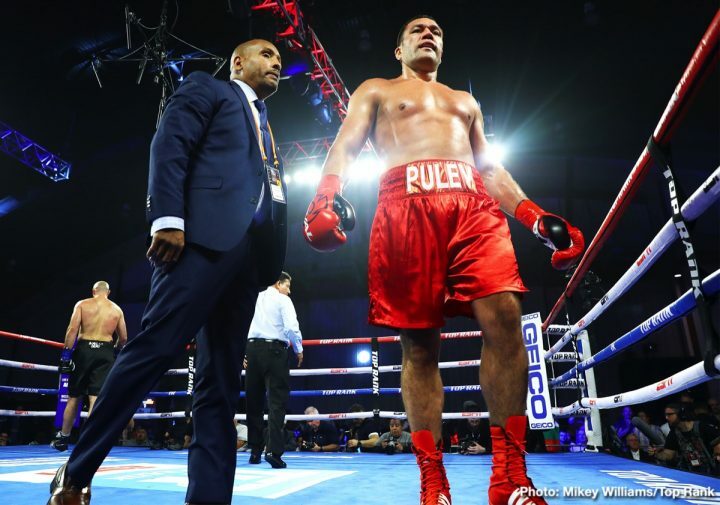 Had Pulev been disqualified for hitting Dinu while he was down in the third, it would resulted in him losing his valuable mandatory spot. 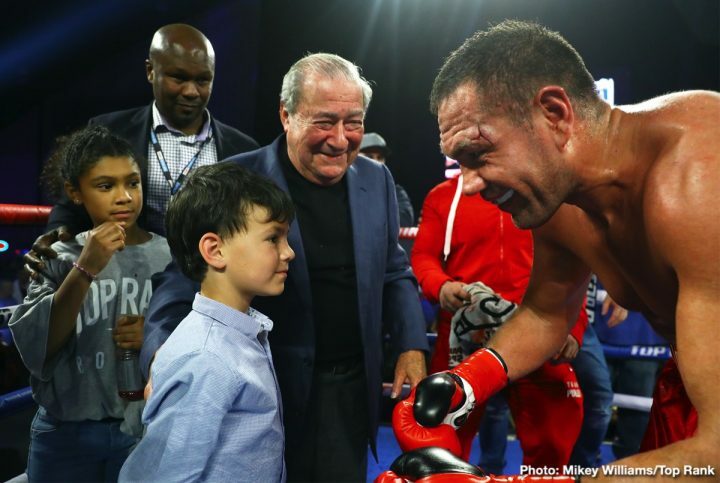 Top Rank wouldn’t likely be too pleased about that, as Pulev is going to make a lot of money for the promotional company when the time comes for him t challenge Joshua for his IBF/WBA/WBO heavyweight titles. Former WBO super bantamweight champion Jessie Magdaleno (26-1, 18 KOs) defeated former WBA 122 lb champion Rico Ramos (30-6, 14 KOs) by a 10 round unanimous decision in the chief support on the card. Magdaleno gave a great effort to try an KO Ramos early on, but it was no use. In the second half of the fight, Magdaleno 27. gassed out a little, and wasn’t as strong as he had been in the first five rounds. The scores were 99-91, 98-92 and 97-93. Boxing News 24 scored it 98-92 for Magdaleno. The victory for Magdaleno gets him back to his winning ways after he lost his previous fight to Isaac Dogboe last April. 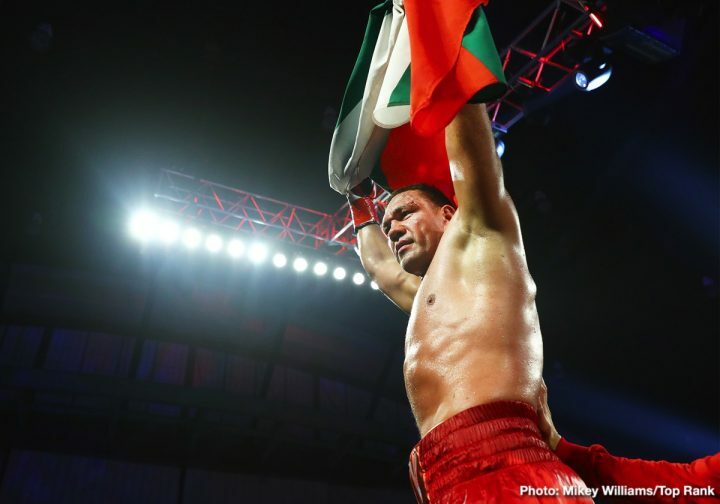 Magdaleno had been inactive ever since. 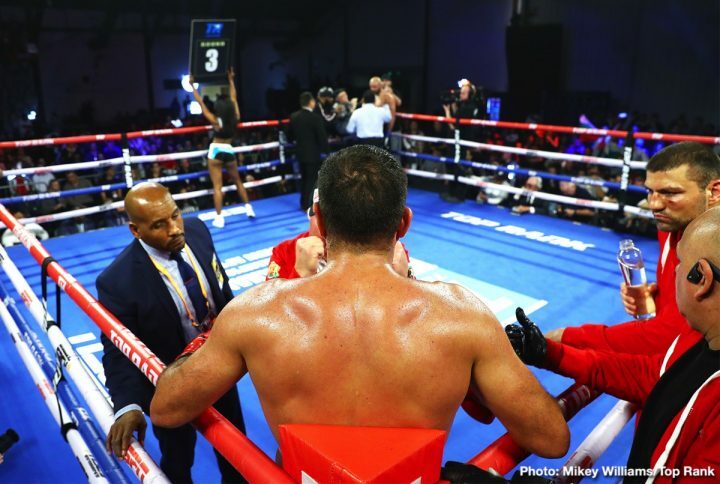 Middleweight prospect David Kaminsky (4-0, 2 KOs) stayed unbeaten with a one-sided four round unanimous decision win over Estevan Payan (1-7-1, 1 KOs). The scores were 40-36, 40-36 and 40-36. Kaminsky dominated the fight from start to finish. Unbeaten light welterweight contender Maxim Dadashev (13-0, 11 KOs) defeated journeyman Ricky Sismidio (35-13-3, 17 KOs( by a 4th round knockout. 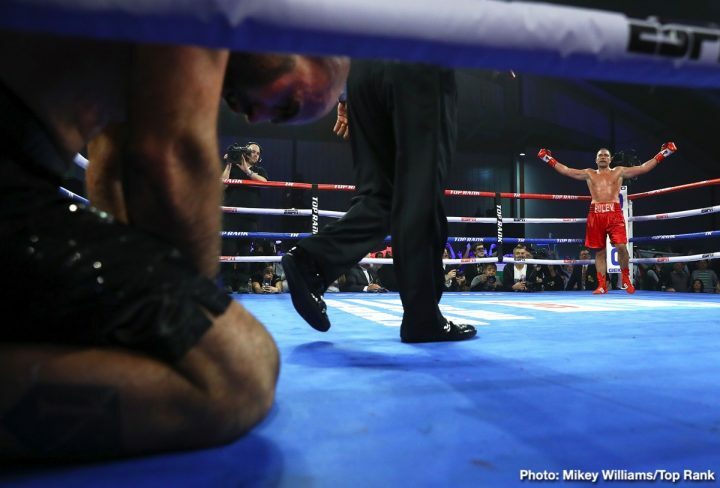 Surprisingly, Sismidio dropped the highly hyped and ranked Dadashev in the second round with a left to the head. In the four round, Dadashev knocked Sismidio down with a big right hand to the head. The referee then stopped the contest. The official time of the stoppage was at 2:50 of round four. 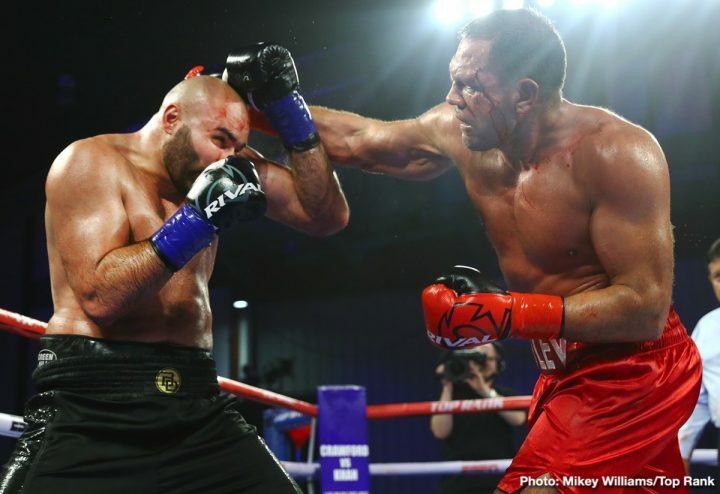 Heavyweight prospect Tervel Pulev (13-0, 11 KOs) defeated journeyman Mitch Williams (16-8-3, 11 KOs) by a six round unanimous decision. The scores were 59-54, 58-55, and 57-56. 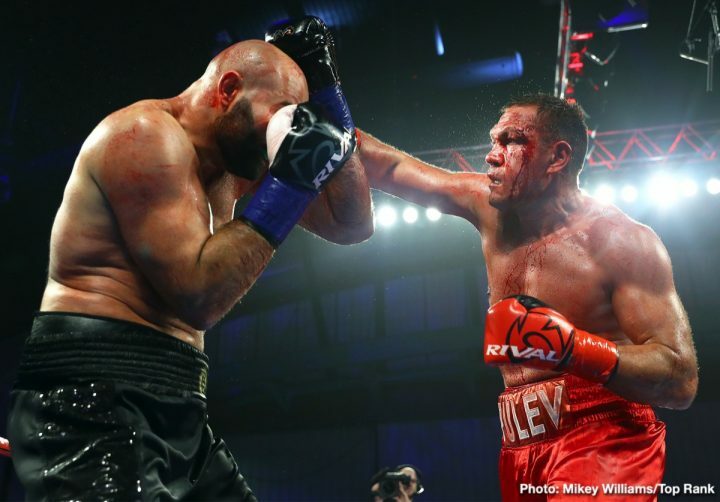 Tervel is the younger brother of heavyweight Kubrat Pulev, who fought in the main event on the card. 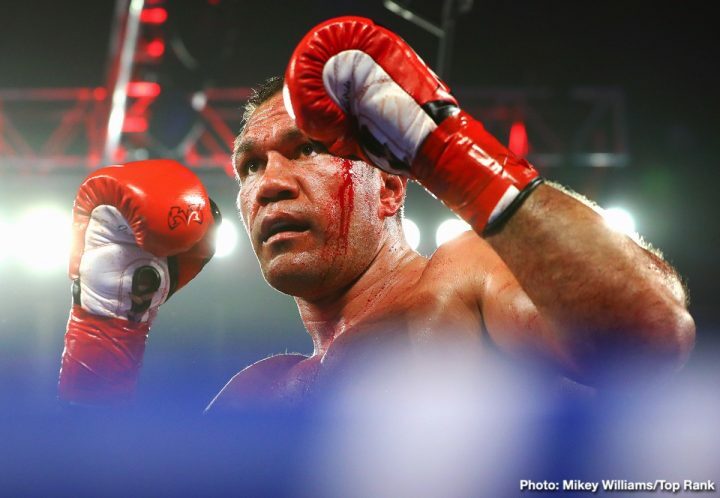 Pulev was docked a point in the fourth round after hitting Williams twice on the break. Welterweight Chris Van Heerden defeated journeyman Mahonry Montes (35-8-1, 24 KOs) by a sixth round tecnical decision. 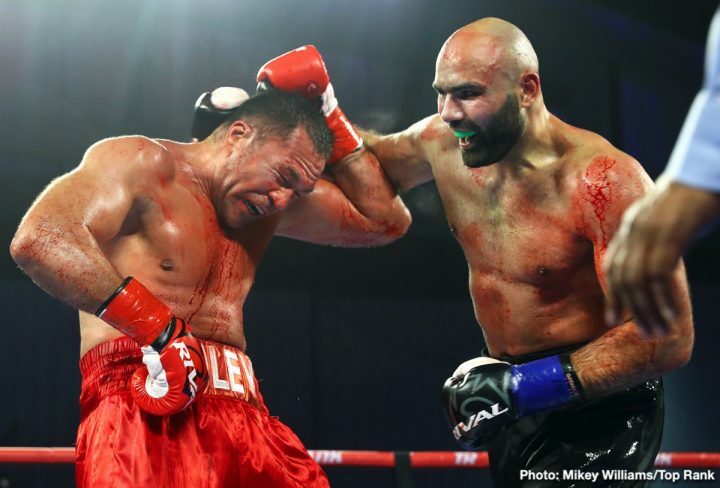 Van Heerden suffered a cut from a clash of heads in the sixth, which led to the fight going to the scorecards. The scores were 60-54, 60-54 and 60-54. Super featherweight contender Erick De Leon (19-0-1, 11 KOs) beat Jose Luis Gallegos (16-6, 12 KOs) by a seventh round knockout. In the seventh, the referee had to stop the fight when De Leon was teeing off on a defenseless Gallegos. 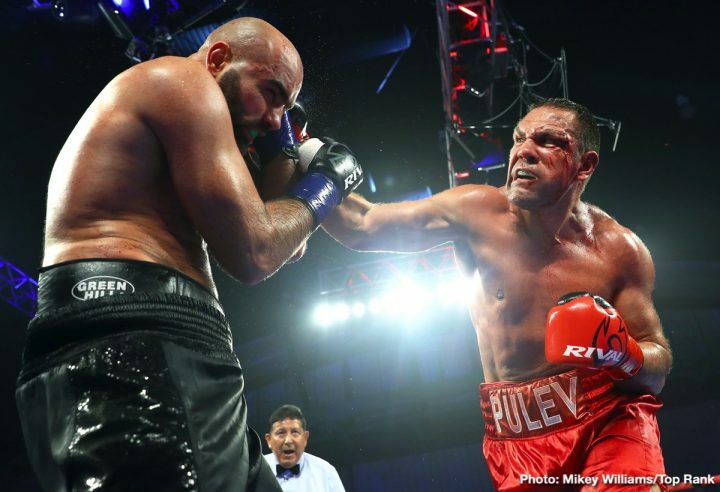 The time of the stoppage was at 1:55 of round seven.